Not as much beading as I'd like being done right now. We spent a long weekend up in Chicago, testing N's travel patience and seeing lots of family. He got to meet great grandparents and see all his grandparents plus cousins and more. We are now home and content. I love the feeling of getting home from an exhausting but successful trip. The boys are asleep and I'm pretending I don't need to go to sleep in in the next half hour to be able to get up for work tomorrow. Some how this spring I found time and energy to put together a small garden out back. I planted tomatoes and peppers in pots like I usually do. 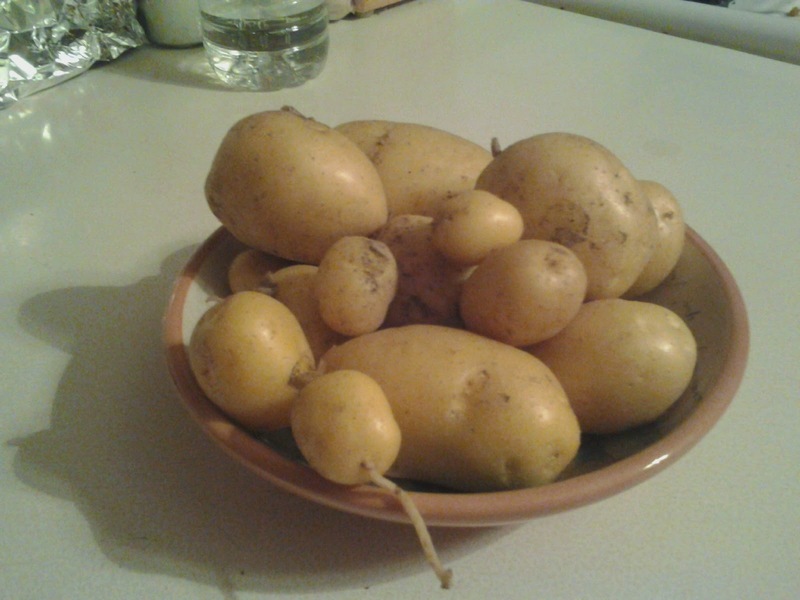 On a whim and with the advise of my neighbor I planted some potatoes. I had a sack of taters that were starting to spud or maybe they spud's bud...not sure. Either way we were potatoed out and I needed to do something with them. So I spoke with my neighbor then decided to plant them. I mixed up a bunch of compost with the soil out there and then made a mound. Planted the budding spuds plus a few rows of pumpkins for R. Tonight I harvested my first couple plants of potatoes. Jackpot!! How have I not planted potatoes before? They were super simple to do and take care of with a huge reward. My peppers are doing well and the tomatoes are ok, R eats any of the cherry ones before I can see them. Pumpkins are just flowering but no fruits are forming. But tomorrow it's sloppy joes and home grown taters for supper. yum! I have an order for a wreath and I'm slowly getting started on it. I have enough petals there for 3 flowers, one lily and two sunflowers. It's funny that's it's taken me this long to get excited about this project. I'm blaming the after the show blues...or maybe it's after the reorganization blues. Once I finish a big project like that I go into a minor funk creatively. This wreath is bringing me out of those blues and into these blues. I'm excited to see where this wreath will go design wise. Tonight I have a date with taking R to swim lessons with N in tow. Then after they go to bed I need to file my taxes. It's written on my hand so I shouldn't forget! My folks moved down today so I'm hoping that's going smoothly. And this weekend we attempt our first travel with N and R. We head up to Chicago for grandparents and a wedding. Hope everyone is enjoying this cool and sunny weather. I'm hoping that tomorrow afternoon I'll get to steal and hour or two on the deck with these flowers. 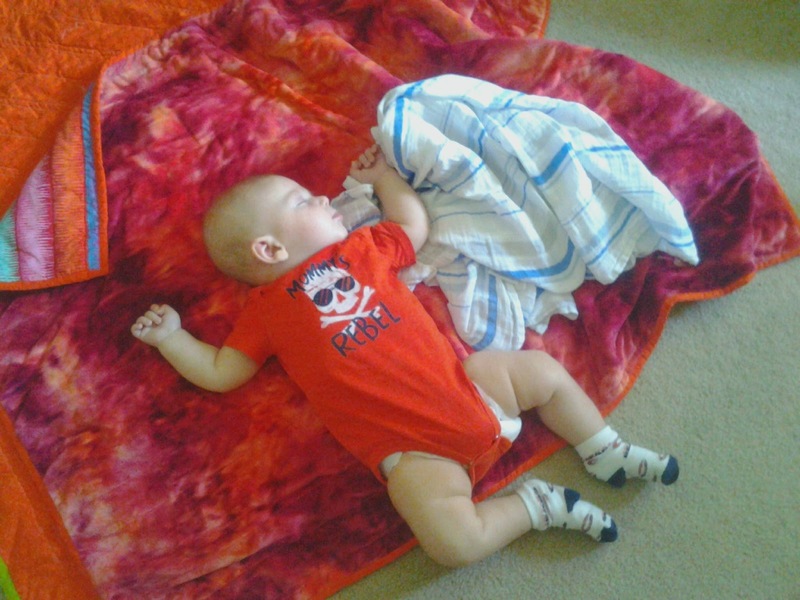 I laid him on the floor so that I could run to the bathroom. I came back and he'd fallen asleep. So here's what's on my to do list right now. ~*~ I want to polish up my social media. Look into Google Plus. Does anyone out there use it? Do they like it? ~*~ Polish up the blog. ~*~ this is a whole blog post on it's own but I received an email about it today. Does anyone use Square as a store front? Are they happy with it? I like the way it looks but am a bit overwhelmed by the fact that I would have to drive all the traffic to it. At least on Etsy I get maybe 1 or 2 random viewers a day. Alright, he stirs. Off to switch back to momma mode and get his jammies on. Is there really a good way to organize a large volume of beads? This past May my grandmas moved into an independent living apartment. She was a beader too. Ok, no, lets face it, I'm pretty sure both my Grandma and me are both bead collectors first and beaders second. We love to have a stash of beads. We need to have what we are looking for in person and on hand for when we need it. It's just the way we work. It's been years since her arthritic hands have been able to string a seed bead, and with the move to a smaller living space she gave her collection to me. It was a bit overwhelming because her collection is a lot larger than mine is. 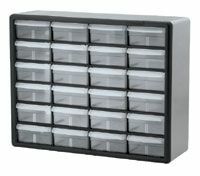 She stored her beads in plastic drawers like the ones hardware stores sell to organize screws and bolts. She had 5 boxes of plastic drawers filled with beads plus a few other piles of boxes and other miscellaneous crafty goodness collected over the past 20 years. With 2 lil boys in the house I have visions of those drawers crashing down and the nightmare of a mess it would be to clean up. So I decided to stay with my box method of organization and go by color. Seed beads are organized by color. Gemstones and glass beads are separated from each other and roughly organized by color. It was a lot of work. I was really enjoying the process though. When I was done I was actually a bit disappointed, partly relieved, and part of me doesn't want to touch it because I know it won't stay this organized! I've posted some peaks of my new bead stash. It's a bit overwhelming in all honesty. Although it's great for when I have a project and I'm looking for just the right thing. Most likely it's in the stash somewhere! ~The show this weekend went well. Not quite as successful as last year, but I broke even and it was fun. I consider that a success. ~I think my booth display is really coming together. I added a table this year that had my jewelry on it. ~I have a lot more inventory than I did last year. Both with flowers and pendants. ~As much as I sell the fancier wine charms I'm not sure I will be making any more. They just don't feel fun right now. ~I think I need to work on putting some eye grabbing pieces in the front. I had the sunflower wreath sitting up front, but that didn't attract much. So I exchanged it for the large vase full of lilies. I'm not sure that helped much. ~I did have a bright purple flower on the other side of the booth that attracted a lot of attention. At least 10 people stopped and looked at or touched that flower. ~I had one repeat customer that sought me out to buy another flower. I had several other people that had bought from me last year stop by and say hello and look around. It was fun seeing all of them again. ~Apparently I make lots of weird faces when I'm setting up my booth. This was the least crazy expression in the pics. ~It was soooo hot over the weekend, I was very sweaty. ~There weren't as many artists there this year. I'm not sure why but really it's a fun show that is decent quality. I hope more people sign up next year. ~I met some really nice artists. ~Here is how I displayed my new jewelry. I had quite a few people looking at the bracelets. Some even tried them on. I think the prices scared them away. But I wasn't really expecting to sell them at this venue. It does encourage me to get them on Etsy. ~I'm not sure what to do next. I'm mentally defragging this week, then I will figure out my next steps. Clean/organize beads, get Etsy up and running again, explore more jewelry ideas.